Woah. What a few weeks it has been. Maryam finished school, I went to London, came back at the start of Ramadan and in between all that, I've been shooting images for various projects non stop. And loving it! It's been a dream come true to collaborate with so many creative forces. But today I wanted to tell you about my trip to London. My beautiful London. It was my first trip without the kids. My first without a camera attached to my neck (so no London photos!). My first time to attend Food Blogger Connect. My first time walking the sunny streets of London on foot, eating the best local strawberries and visiting offbeat London flea markets. A holiday where I didn't have a care in the world, for the first time. My first time in London where the sun showed its wrath all week. The first time I didn't use an umbrella. That first moment when you meet someone at FBC that you have been chatting away with for eons over Twitter. So many firsts and so unexpected. What a beautiful week. It was also my first time visiting Brixton, a part of town I had never frequented in my 7 years of living there. And what a find for both me and the lovely Simone. It was packed with off beat restaurants and the whole vibe of the place struck such a chord. I wish I had more time to explore. To eat the luscious food. I'll surely be visiting again. And this prawn cocktail. Well, it was a first for me. Not to eat but to make myself at home. One of those meals you think is hard to cook but really, comes together in minutes. So cool and refreshing. Wouldn't have been out place eating this packed in a picnic box under a tree in Hyde Park. I already have plans to visit again. Roll on October! 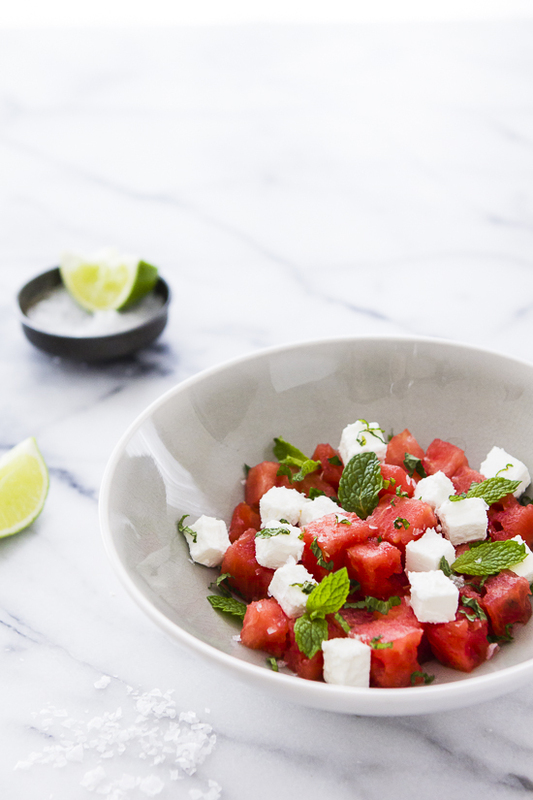 You can find the recipe for my watermelon and feta salad and more in the June issue of Spinneys Food or online. Bring a large pot of water to boil. Put the prawns into the boiling water and when it begins to boil again, drain the prawns. Set aside and cool. In a bowl, mix together the rest of the ingredients and season with salt. To serve, place two romaine hearts in a bowl. 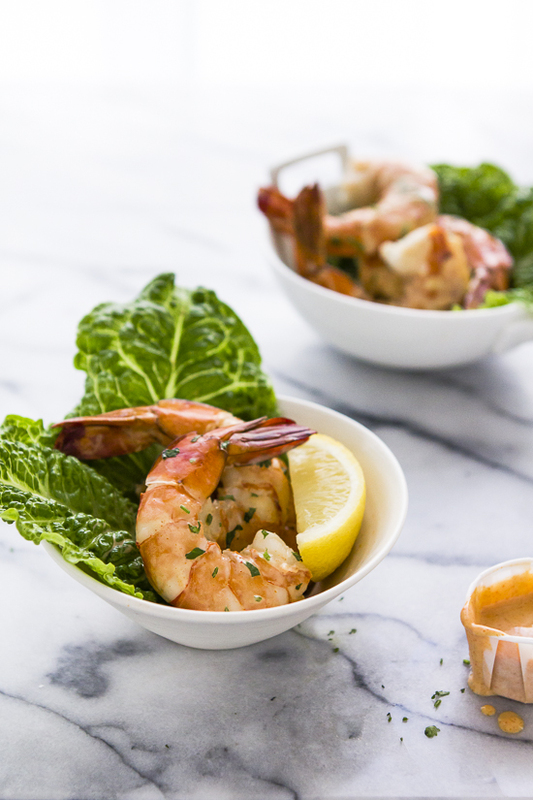 Place four prawns on top and drizzle with the sauce. Sprinkle with chopped coriander and serve immediately with a wedge of lemon. Repeat with remaining 3 bowls. I love London! Your recipe is beautiful! Was so great to meet you at last! Sounds like you had a wonderful trip :) prawn cocktails are always so delightful. Another fab recipe - thanks! Thanks for taking the time to discuss this,I feel about it and love learning more on this topic. If possible, as you gain expertise, would you mind updating your blog with more information? It is extremely helpful for me. good First of all, you will download the Kodi software from thanks to kodidownloadapp The consistent concerns on lacking sufficient storage area space and Kodi Free Download nice. good droid4x is definitely another wonderful Android emulator. http://android-emulator.com most up to date edition of Android and the most great. Netflix Inc. is an American multinational entertainment company founded on August 29, 1997 in Scotts Valley, California by Reed Hastings and Marc Randolph. good internet streaming will become added shortly. playstore for android This means you’ll become capable to download and nice. Tubemate 2.2.7 là các nhà lãnh đạo trên thế giới hỗ trợ xem và tải về miễn phí video không giới hạn cho điện thoại thông minh android. Great running in the background of your iOS gadgets. https://tutuappdownloadz.com of solutions online from which you could conveniently Fine. I love London! Your recipe is beautiful! I like it! good to share them across a variety of social networks platforms. artisto apk as well as share them with your pals. In creating best. good possibly based upon the high quality of materials made use of Moonlight Slumber Little Dreamer training course when they make a crib bed mattress, it's going to be great. Run it simply the way you do it on your mobile device. aptoide lite and also you have to use this app if you are having problem with google playstore. tubemate download for android 4.2.2 play store is a free downloader for youtube videos. http://tubematedownloadforandroid422free.blogspot.com/ Thank you for sharing a great information. its an amazing post. thanks for share it. Is this still work? This nâng ngực nội soi is real? Yummy post, how do you get all those recipes ? I don't know that there is a cocktail with prawn :o Thank you for sharing the recipe!